Vitamin D is also known as "Sunshine Vitamin" because it is manufactured by the body after it is exposed to sunlight because direct rays from sunlight trigger vitamin D synthesis in the skin. Vitamin D is a very stable fat soluble vitamin. 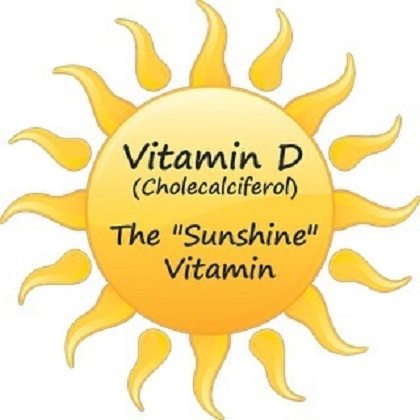 Like other fat soluble vitamins, the body is capable of storing Vitamin D for later use. Due to its excellent stability, it is not broken down during food preparation or exposure to heat sources. Vitamin D2 also known as Ergocalciferol, is derived from plant sources. Vitamin D2 is synthetically made from radiating a compound (ergosterol) from the mold ergot. Vitamin D3 also known as Cholecalciferol, is derived from animal sources. The body can also synthesize vitamin D3 (Cholecalciferol) in the skin, from cholesterol, when sun exposure is adequate. Vitamin D helps in the absorption of calcium, helping to form and maintain strong bones. If you eat foods rich in calcium but don't get enough vitamin D then it would be impossible for your body to absorb sufficient calcium. Hence to absorb calcium it is essential to consume vitamin D rich foods as well. Vitamin D is also essential for healthy bones and teeth. Without vitamin D, bones become thin, soft and brittle can be broken easily. 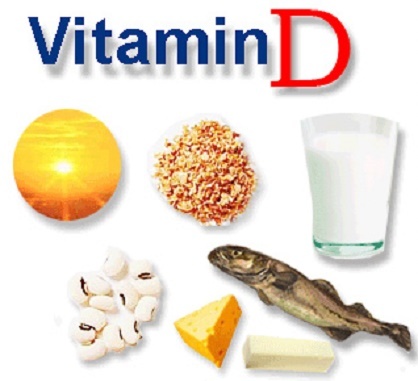 A deficiency in Vitamin D also affect teeth growth and may cause many dental problems. Vitamin D also helps to improve mental sharpness. People who eat foods with high content of Vitamin D have higher memory and information processing capabilities than those with lower level of Vitamin D.
Vitamin D provides calcium balance in the body and prevents arthritis. Additionally a diet rich in Vitamin D also prevents from joint pain and inflammation. Vitamin D prevents rickets in children. Rickets causes skeletal deformities. Children with sufficient level of Vitamin D are at lower risk of rickets as compared to those who don't get enough Vitamin D.
Vitamin D also prevents osteomalacia in adults. Osteomalacia causes muscular weakness and weak bones. Foods rich in Vitamin D helps a lot to prevent Osteomalacia. Vitamin D also prevents certain cancers such as breast cancer, prostate, and colon cancer. Recent studies have shown that people with higher level of Vitamin D are at lower risk of developing such cancers as compared to those who don't have sufficient Vitamin D.
Anti oxidant properties of Vitamin D fight against skin damaging free radicals, that may causes premature wrinkles. Hence eating foods rich in Vitamin D slow down the appearance of wrinkles and other signs of aging. Recent scientific researches have shown that Vitamin D can prevent and reduce the severity and frequency of asthma symptoms. Additionally Vitamin D not only improves lung function but help you breathe well and feel better. Vitamin D not only improves muscle function but also enhances muscle strength including recovery from exercise and daily activities. Lower level of Vitamin D can lead to physical fatigue. Vitamin D deficiency may also cause muscle cramps in adolescent boys and girls. Vitamin D is found in animal fats including organ meats, butter, egg yolks and full-fat dairy products. Milk that has been fortified with Vitamin D is a really good source because it has the added bonus of providing the body with calcium.Other foods that have been fortified with this vitamin, such as orange juice and cereals, are other reliable sources. Foods that are rich in Omega-3 fatty acids such as salmon, mackerel, tuna and sardines are other good sources.Cod liver oil is also a good source of Vitamin D. Exposure to sunlight(UV)is also a good source of Vitamin D. We must expose our body to sunlight at least for 10 to 15 minutes and we must repeat this activity 3 to 4 days per week. Avoid over exposure to direct sun rays because it can cause photoaging (sun-induced skin aging). (i) In children Vitamin D deficiency results in Rickets. The primary symptoms of this disease are soft bones and bones that develop abnormally. Infants that do not get sufficient Vitamin D can develop a condition in which bones do not harden. This results in bowed legs, stunted growth and a lot of pain. (ii) In Adults insufficient levels of Vitamin D can cause osteoporosis, a condition in which bones become weak and fracture easily. (iii) Muscle weakness is an other symptom of Vitamin D deficiency. A severe deficiency of Vitamin D may cause difficulty in climbing stairs or getting up from the floor or a low chair, or can lead to the person walking with a waddling pattern. Muscle cramps even after a minor physical activity or exercise is an other symptom of Vitamin D deficiency. The recommended daily intake for adults is 600 IU (International Units). Individuals aged 50-70 should increase their intake to 700 IU and those older than 70 should get even more than 700 IU/day. This is because the ability of skin to convert vitamin D into its active form decreases as we grow older. Also, the kidneys, which help, convert vitamin D to its active form, sometimes does not work well in older people.